Mountain biking can be a very expensive sport: there are hundreds of excellent bikes available for $4,000 to $6,000 and those aren’t even at the highest end of the price spectrum. Fortunately for those of us not ready to spend so much on something without a motor, there are plenty of great bikes for under or around $2,000. And the good news is that much of the technology that has pushed the sport year over year has trickled down into this category. Below are our picks for 2019, which range from lightweight XC hardtails to all-mountain-ready full-suspension rigs. For more background information, check out our comparison table and buying advice found below the picks. And for those sticking to a stricter budget, see our article on the best mountain bikes under $1,000. Tires: 29 x 2.3 in. What we like: Design and geometry of a premium model, with affordable components and price. What we don’t: No dropper post included. Specialized isn’t typically known for making budget-friendly full-suspension bikes, but we’re thoroughly impressed with the value of their new Stumpjumper line-up. Coming in at $1,870 and sharing the same design as their top-of-the-line carbon models, the Stumpjumper 29 ST is a premium bike at a very respectable price. With a versatile amount of travel (130mm front and 120mm rear), 29-inch wheels, and modern geometry, the bike is very capable on technical trails. Plus, the pairing of a 1 x 11 Shimano SLX drivetrain with a wide range cassette should easily see you to the top of most climbs. While expert riders may find the Stumpjumper’s components lacking, we think the highly adjustable RockShox Recon RL air fork and Tetkro hydraulic brakes will keep most beginner and intermediates happy. Tetkro may not be a household name, but we’ve been impressed by their performance and would happily put them up against entry-level stoppers from Shimano and SRAM. If the Stumpjumper 29 ST were to come up short in one area, it would be its lack of a dropper post—the Giant Trance below features a dropper for just $80 more. But with smart component choices and a well-balanced ride that makes it feel more premium than the $1,870 price tag would suggest, the Specialized Stumpjumper 29 ST takes our top spot for 2019. Tires: 27.5 x 2.8 in. What we like: Great price + quality components = incredible value. What we don’t: Aggressive riders will find the Cujo lacking. At first glance, you may find yourself wondering how a bike with no rear suspension managed to nab our #2 spot. But for as much as the Cannondale Cujo 2 may lack in cush, it makes up for it in a quality component selection and low $1,300 price tag. The Cujo is thoroughly modern and quick on the trail—2.8-inch tires smooth out small bumps while providing a surprising amount of traction, and the 1 x 11 Shimano SLX drivetrain is a great match for hilly rides. And although the Trans-X dropper post is a bit of an unknown at the moment, it has proven to be flawless in our testing thus far. Furthermore, as with many Cannondale bikes, the Cujo 2 features a high-quality aluminum frame with lifetime warranty. Unsurprisingly, the Cujo 2’s affordable price tag comes with a few compromises. When held up against the competition, the RockShox Judy Silver fork doesn’t feel as plush, the entry-level Shimano hydraulic disc brakes don’t offer as much bite, and the WTB Ranger tires prioritize fast rolling over all-out grip. If you’re looking for a hardtail to ride aggressively downhill, this isn’t the one. Upgrading to the premium Salsa Timberjack 1 below addresses most of these issues, but you’ll face a hefty $699 increase in price. For the budget shopper willing to put up with a few small shortcomings, we think Cannondale’s Cujo 2 makes for a great first mountain bike that will last. What we like: High-end frame with a dropper post. What we don’t: Small gear range; some questionable components. For aspiring all-mountain riders, it doesn’t get much better than the Giant Trance. This full-suspension rig is a nearly ideal entry-level build, with geometry that puts you in a comfortable position for both climbing and descending. The combination of a 150-millimeter front fork and 140-millimeter rear shock provide confidence on rough trails, and trusty Shimano hydraulic disc brakes keep speed in check. And while the components, in general, are on the budget end, the Trance’s high-end frame is an excellent blank canvas for future upgrades. What are the downsides of the Trance 3? First off, at over 31 pounds, weight is on the heavy side for long slogs (that listed weight doesn’t include pedals, too). Additionally, the slightly dated 1 x 10 Shimano Deore drivetrain may have many wishing for more gears on steep climbs. And finally, brand-conscious riders will likely be left wondering about the SR Suntour Aion fork, which isn’t nearly as well-known as offerings from RockShox or Fox. The Stumpjumper ST above is the better all-around bike, with nicer components and a cheaper price (however, it does have less travel than the Giant). But even with these shortcomings, the Trance 3 provides great value in a ready-to-shred package. 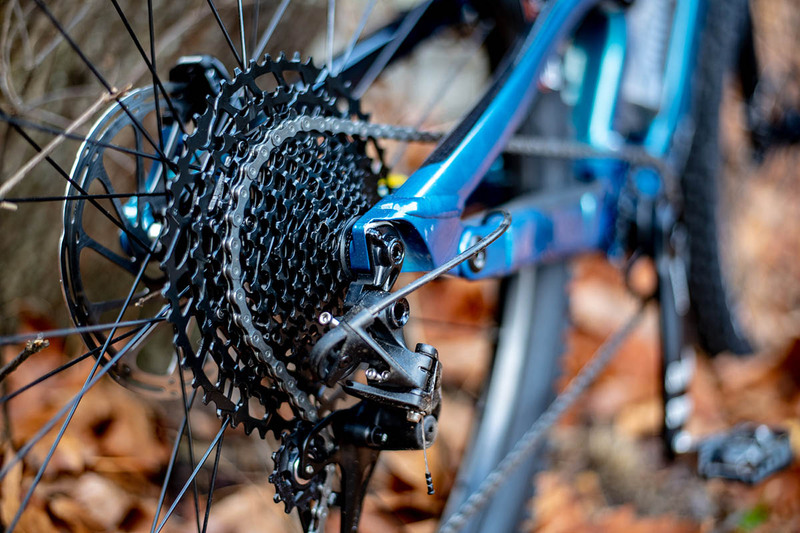 What we like: SRAM NX Eagle 12-speed drivetrain provides a wide range of gears. What we don’t: Pricey for a hardtail. At just under $2,000, the Salsa Timberjack NX Eagle is the most expensive hardtail to make our list, but it packs a serious punch. The Timberjack is the only bike here to feature SRAM’s new NX Eagle 12-speed drivetrain, which provides a wider gear range than almost all 11-speed systems. Furthermore, the Timberjack includes a quality RockShox Sektor air fork, a dropper seat post from Trans-X, and burly 2.8-inch tires from WTB, all of which are ideal for aggressive riding and technical trails. And as with many Salsa bikes, it’s set up to be easily converted for bikepacking with custom-fit Salsa-branded frame bags (available separately) and varying drivetrain options. What we like: Quality frame and brand reputation. What we don’t: Budget components subtract from value. At $1,999, Trek’s Fuel EX 5 29 just barely makes our $2K cutoff—but the Fuel lineup is such a classic that we couldn’t help but sneak this entry-level model in. The EX 5 shares the same proven suspension platform and geometry as Trek’s top-of-the-line aluminum models, but comes in considerably less expensive. This makes it a great option for aspiring riders to start small and upgrade when ready. Furthermore, we think most intermediate riders will be more than happy with the highly adjustable RockShox Recon air fork and Deluxe rear shock. A quick glance at the spec list shows that sacrifices were made to get the Fuel EX 5 in below the $2,000 mark. You’ll find a dated 10-speed Shimano Deore drivetrain, budget Shimano hydraulic disc brakes, and a wide assortment of house brand parts. As a result, this bike isn’t unlike the similarly-priced Trance 3 above—a high-end frame with disappointing components—but without a dropper post to boot. All that said, the Fuel EX 5 leaves you well-positioned for future investments, and even out of the box, the sum of these parts would have been considered top of the line only a few years ago. 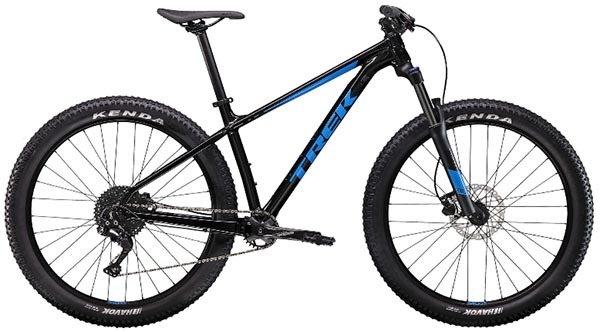 We still think the Trek is one of the best full-suspension mountain bikes under $2,000, and will more than satisfy beginner and intermediate mountain bike buyers alike. What we like: Fun on the descents (for a hardtail). Santa Cruz’s entry-level bike, the Chameleon, is as fast and capable of a hardtail as you will find on this list. And the componentry isn’t half bad either—you get a user-friendly RockShox Recon front fork that’s a strong performer in the trail/all-mountain field, and SRAM’s NX 1 x 11 drivetrain that’s equally adept at long climbs or rolling XC trails. There’s nothing breakthrough in the design of the Chameleon—and the derailleur and shifter are a slight step down compared with others on this list—but it’s a proven build that’s good, honest fun. 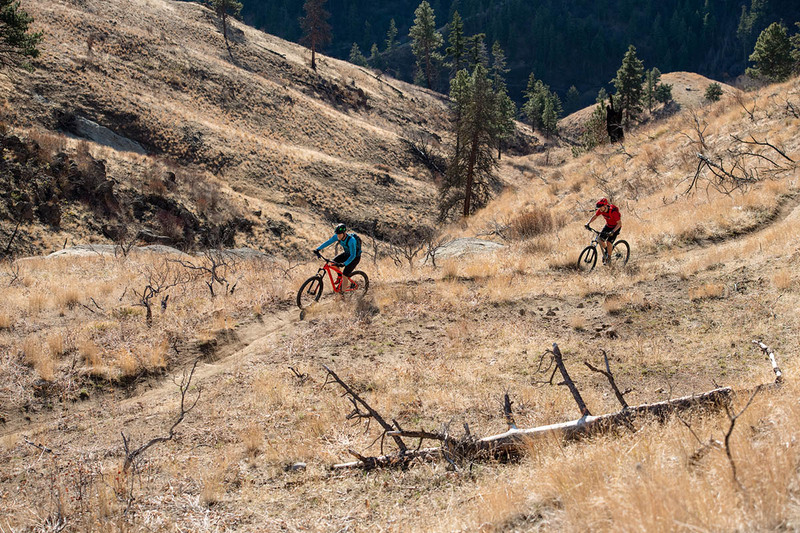 While you’ll never be able to match the all-out speed of full-suspension bikes on the descents, you’ll likely have just as big of a smile at the end of the trail aboard the Chameleon. Who should opt for the Santa Cruz Chameleon? Its strong performance and simple set up and maintenance make it a great choice for serious riders needing a winter steed (hardtails are easier to clean and keep functioning in wet environments). Furthermore, the comfortable feel and 28-pound weight make it a fine choice for covering serious miles. Uber-aggressive riders will want to stick with a full-suspension bike like the Giant Trance above, but hardtail fans will love the capabilities of the Chameleon. If you’re pinching pennies, the Cujo 2 is a better value, but there’s no denying the overall design and solid performance of the Santa Cruz. Tires: 26 x 4.0 in. What we like: Responsive and nimble for a fat bike. What we don’t: Not versatile. Carbon fiber is typically reserved for bikes costing $3,000 and up, but consumer-direct bike brand Canyon and their Dude CF 8.0 model slips in at $1,999. The Dude is a zero-suspension fat bike—an outlier on this list—but boasts a number of qualities that make it impressively nimble and responsive for its build. A lightweight frame and fork and modestly-wide tires (for a fat bike) keep the weight relatively low at under 27 pounds without sacrificing the durability and stability fat bike riders love. Plus, the stiff carbon frame and fork, aggressive tires, and SRAM NX 11-speed drivetrain make it an excellent pairing for long adventure rides in all four seasons. The downside of a fully rigid fat bike comes in its lack of versatility: the Dude will not be your one-quiver ride. The fully rigid set-up will feel jarring and out of place on rough descents, and the extra heft of the large tires will be noticeable on sustained climbs and during any attempt to accelerate quickly. Also, buying directly from a company—as opposed to a bike shop or reputable online retailer—can have its own challenges: at the time of publication, the Dude is out of stock and Canyon’s customer service is lacking. But all things considered, if you want fat-bike capabilities at a very lightweight and reasonable price, the Dude deserves a look. What we like: Great price. What we don’t: Not as versatile as the Cannondale Cujo 2 above. 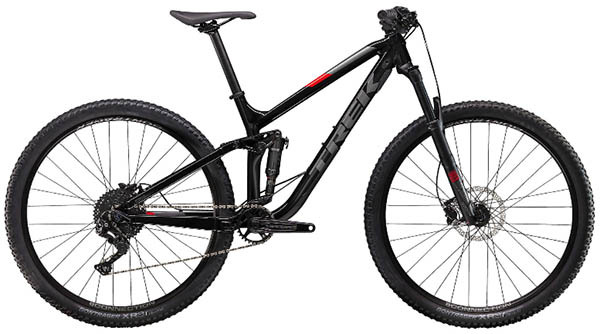 Coming in at $1,019, the Trek Roscoe is the most affordable bike here and has almost everything an aspiring rider needs. While the Shimano Deore 10-speed drivetrain can’t match the gear range of the Cujo 2’s 11-speed above, it’s perfectly reasonable for all but the steepest of trails. And when it’s time to come back down, Tektro’s hydraulic stoppers provide predictable and solid braking power. The SR Suntour 120-millimeter coil sprung fork will have expert riders wishing for more adjustments, but it is more than adequate for the majority of first-time mountain bike buyers. As with any budget model, there are bound to be shortcomings, and the Roscoe 6 is no exception. In comparison, Cannondale’s Cujo 2 above boasts an upgraded drivetrain and a dropper seat post, both adding significant amounts of versatility. Additionally, the Cujo’s RockShox Recon air fork offers much greater customization than the Roscoe’s SR Suntour. You’ll pay an extra $280 for the Cannondale, but the upgrades make it much more trail-worthy in our opinion. With that said, if you’re on a strict budget and the Cujo 2 is out of reach, we would happily recommend Trek’s Roscoe 6. What we like: Time-tested model; high-quality Shimano SLX drivetrain. What we don’t: Hardtail is limiting, XC-oriented geometry isn’t for everyone. 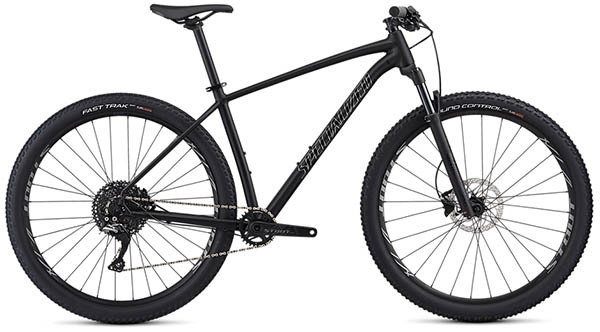 Specialized’s Rockhopper was first released in the mid-80’s, but in 2019 this line-up is still one of their most popular. 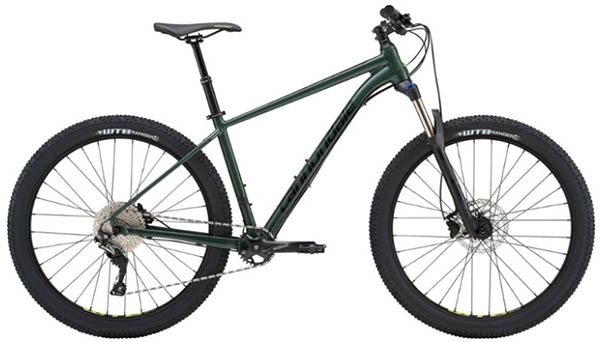 Coming in at $1,300, the Pro 1X is the most premium of the Rockhopper models and leaves little to be desired from a XC hardtail in this price range. The 1 x 11 Shimano SLX drivetrain provides smooth and reliable shifting during race scenarios, and the relatively lightweight 80-100-millimeter travel RockShox Recon air fork (varies based on frame size) is the perfect companion for relatively smooth, long rides. The Rockhopper’s quality components and comfortable riding position are a great pairing for XC use, but aggressive riders will be left wanting. The relatively steep head tube angle and minimal amount of suspension travel can’t keep up on the downhill with a longer and slacker hardtail like the Santa Cruz Chameleon above. And if a hardtail’s not enough, springing for the full-suspension Specialized Stumpjumper ST will set you up better for the long term. But for a well-equipped XC-oriented hardtail, the Rockhopper Pro 1X is a great option. Tires: 26 x 4.5 in. What we like: A durable fat bike that can take a beating. What we don’t: Very heavy, not as nimble as the Canyon Dude. Fat bikes took the industry by storm with their phenomenal grip, cartoonish looks, and 4- to 5-inch wide tires that take you comfortably over sand, snow, and rocks. Diamondback’s El Oso Dos puts it all together in a nicely-appointed fat bike that’s built to thrive in rough Midwestern winters and still be fun when things thaw out. 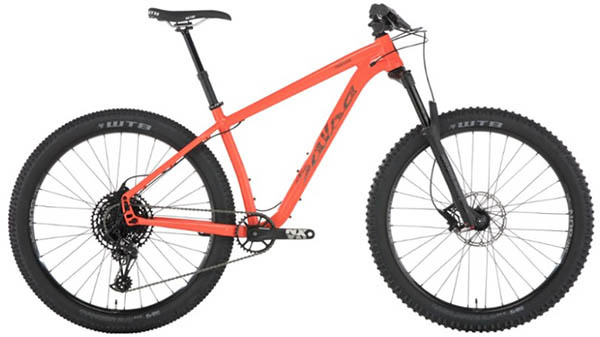 The frame has been stiffened for trail (ab)use, you get an aluminum fork with braze-ons for mounting racks, and quality TRP Spyre mechanical disc brakes in both the rear and front provide reliable stopping power no matter the environment. Let’s be clear though: as your daily-driver mountain bike, fat bikes aren’t for everyone. While the roll-over-anything personality is its own kind of fun, it certainly is not as quick or playful as a traditional mountain bike. What’s more, hefty tires aren’t a complete replacement for quality suspension that absorbs techy trail sections. Plus, weighing in at over 35 pounds, the El Oso Dos is heavy even for a fat bike, which is why we prefer the Canyon Dude and its lightweight carbon frame. But if you aren’t out to set any PR’s and just want to have a good time in the muck, the El Oso Dos is a winner. Tires: 27.5 x 2.6 in. What we like: Great price for a full-suspension bike. What we don’t: Significant downgrade in components. We rarely recommend a full-suspension bike at such a low price-point—they’re typically too compromised in design and components—but the Stance 2 earns a spot on this list as a surprisingly capable rig. Outfitted with a 120-millimeter mid-range Suntour fork and shock along with Maxxis 2.6-inch tires, the Stance is smooth on the trail. And while its geometry could be seen by some as a bit dated and won’t feel super confident on steep descents, the cushioned ride is a nice consolation on more mellow terrain. As expected, the Stance’s components are a step down from the more expensive full-suspension rigs here, but they are still decent Shimano parts. Shimano hydraulic brakes are a reliable choice, and the Stance comes with a dropper post, which is one of our favorite features of current bikes. Perhaps the biggest sacrifice we see is the 2 x 9 drivetrain, which will feel slow and clunky for experienced riders. In fact, we think it’s worth spending a few hundred more for the Specialized Stumpjumper above, which comes with a 1 x 11 drivetrain and more modern geometry. But, if you’re set on getting a new full-suspension bike for $1.5K, the Stance is a fine choice. Carbon Fiber Frames: Are They Worth It? Should I Buy a Used Bike? As the name indicates, cross-country (XC) mountain bikes are typically made to be ridden on mellow terrain where the chances of encountering technical descents and jumps are unlikely. These rigs are designed to be as light and efficient as possible for long days and uphill travel, and excel most on buff singletrack and fireroads. XC bikes will often lack rear suspension, have skinny and fast rolling tires, feature short travel forks (ranging from 80-100mm of travel), and have steep head tube angles, all in the name of efficiency and saving weight. A bike like the Specialized Rockhopper Pro 1X is great for XC racing and long days of riding, but can’t match an all-mountain or downhill bike on steep, techy trails. Trail bikes are a relatively new phenomenon in the world of mountain biking, and attempt to bridge the gap between the XC bikes above and the all-mountain shredders below. With their relatively low weight and 120-140 millimeters of suspension travel front and rear—just enough cushion to make root-filled trails fun and enjoyable, yet not so much that climbing up the mountain has you longing for a hardtail—they make a lot of sense for those desiring a one-bike quiver. It’s our opinion that trail bikes are perfectly suited for about 80% of mountain bikers and would be our go-to choice if we were forced to ride one style of bike. All-mountain bikes up the ante and are designed to tackle steep descents and technical trails. These rigs typically feature 140-160 millimeters of suspension travel (front and rear), large grippy tires, and slack geometry—a nod to their descending intentions. Bikes in this category will be heavier than the trail bikes described above and as a result, won’t climb hills quite as well—but they’re a whole different beast when the trail points down. They’re also commonly very expensive, but Giant’s Trance 3 above is one notable exception. 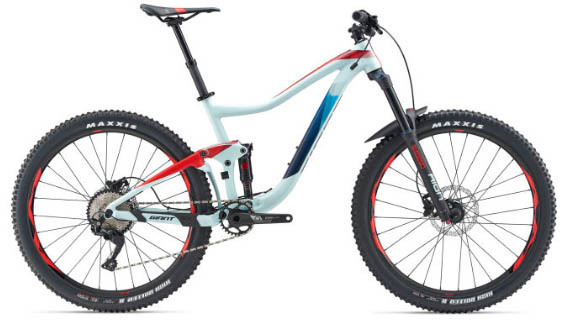 Taking the all-mountain design one step further is the enduro bike, which includes slightly more travel and slacker angles to increase downhill prowess. Downhill and park bikes have one thing in mind: descending. They are typically the heaviest bikes in the group and prioritize traction and control over pedaling efficiency. Downhill bikes feature heavy and grippy tires, 180-200 millimeters of travel, and are the slackest of the bunch. While downhill rigs are an absolute riot to ride, their lack of gearing and heavy weight render them useless when the trail points any direction but down. If you’re lucky enough to live somewhere like Whistler (where lifts can take you to the top), then a downhill bike makes sense. But for the rest of us sad souls, we’d be better served by the increasingly more capable all-mountain/enduro bikes described above. If the idea of riding on sand or snow sounds like the best way to explore on two wheels, then fat bikes should be at the top of your list. 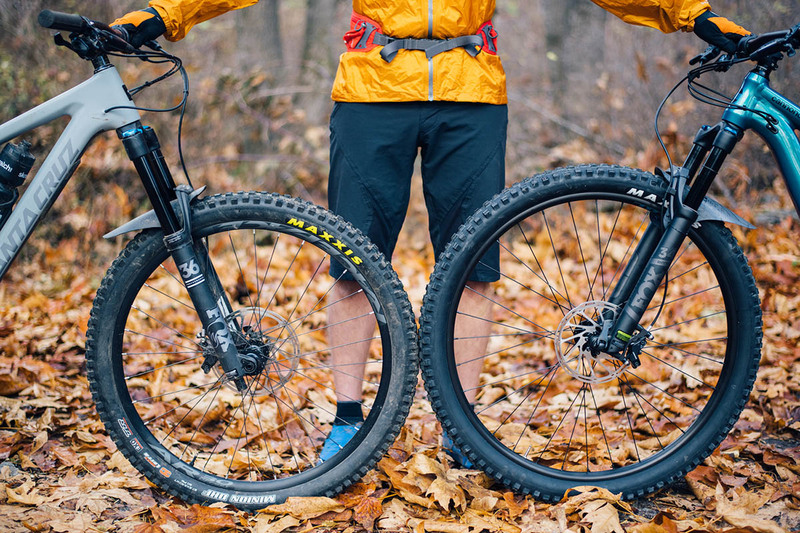 These bikes, highlighted by their bulbous and almost cartoonish looking tires, are able to float on top of terrain that would otherwise halt a standard mountain bike in its tracks. Fat bikes typically have tires ranging from 3.5 to 5 inches in width, which when combined with their ability to run very low pressures (5-15 psi), allow riders to stay atop soft terrain like snow and sand. Fat bikes can also be ridden on dirt trails, but because of their large and heavy tires, they will feel slow and quite sluggish when compared to standard mountain bikes. While fat bikes typically aren’t the most versatile rigs out there, they are undoubtedly fun on the right type of terrain. In the $1,000 to $2,000 range, you’ll find yourself weighing a number of options, the most significant of which may be rear suspension. Is the extra cushion worth the added weight and complexity? At this price point, would a hardtail be a higher-quality, more reliable choice? One major factor to consider is where you typically ride: when the trails aren’t particularly rough, rear suspension isn’t necessary and a lightweight hardtail can actually be more fun and flickable. But on rugged terrain—like the rock- and root-filled Pacific Northwest—a full-suspension bike can be the difference between a fun ride and never wanting to touch your bike again. Designing and building a rear suspension is a very complex, lengthy, and expensive process—not to mention the cost of the shock itself. As a result, you’ll see notable component upgrades on hardtails—particularly shifters, brakes, and the front suspension fork. 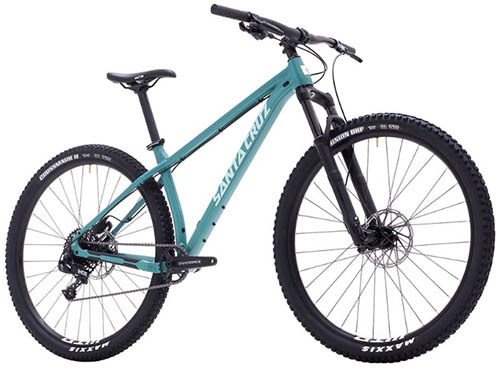 For example, our second full-suspension pick, the Giant Trance 3, comes with a 1 x 10 drivetrain, while the hardtail Salsa Timberjack 27.5+ includes a much nicer 1 x 12 set-up for the same cost. These higher-end components are typically smoother-operating and longer-lasting. In sum, if you can do without a rear shock, you’ll be getting more bike for your money. Another factor to consider is long-term maintenance. Many folks will pick up a hardtail as a wet-weather or winter rig, as the rear linkage of a full-suspension bike is just one more thing to take care of. The additional pivots, bearings, and bushings require cleaning, re-greasing, and general love to keep from seizing up or rusting out, and when you come off the trail with bike and body completely covered in mud, it’s sometimes nice to simplify the cleanup. Here, bikes like the Cannondale Cujo or the Santa Cruz Chameleon really come in handy—these capable hardtails are able to keep a similar pace with full-suspension models on many smoother trails, are a riot to ride, and a breeze to maintain. All that being said, for folks that want a single bike to get them through the toughest terrain, it's hard to beat a quality full-suspension design. You’ll hear the term “rollover” used a lot in describing a 29er, and it’s a fair point. The larger wheels have a more favorable angle of attack and aren’t as affected by rocks and roots as a smaller wheel, which in turn lends to a more solid platform. This comes at the sacrifice of some quickness and playfulness on tight and twisty trails. Furthermore, wheelsets are heavier in this entry/mid-level category, and a 29er’s greater "wheel" estate translates to extra heft to drag up a long climb. A $2,000 29er is less of a grin-maker than a comparable 27.5 bike (or the old 26-inch), but it is a stable companion that allows a hardtail like the Santa Cruz Chameleon or a full-suspension XC design to outperform expectations when the going gets rough. Riders looking for a playful bike that is easy to maneuver and responds eagerly to quick inputs will likely prefer the 27.5-inch wheel design. Also known as 650b, this wheel size is less cumbersome on tight trails than a comparable 29er, and smaller riders will find it often provides a better overall fit and feel. You will give up a bit in terms of pedaling efficiency and grip, and nothing can match the confidence-inspiring rollover of a 29er. But for uphill or endurance-oriented riders, a bike like the Giant Stance is lighter on climbs and delivers better acceleration too. 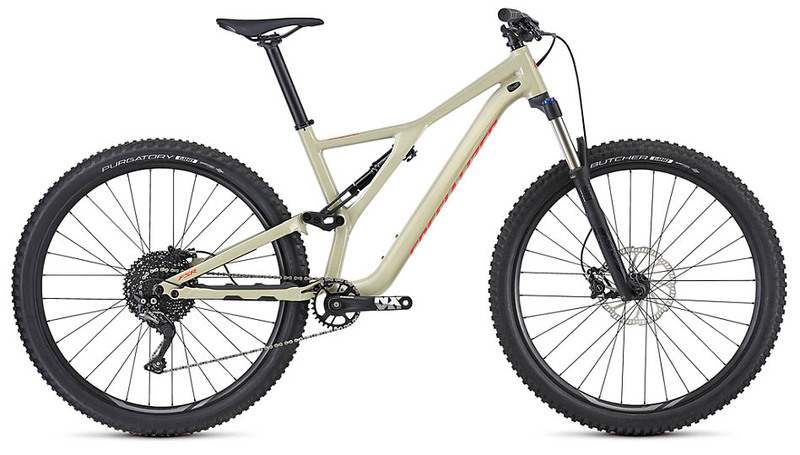 First there was the 29er, then came the 27.5, and now we have the 27.5 Plus. The first two refer simply to wheel diameter, while the final one tacks on an indicator of tire width. 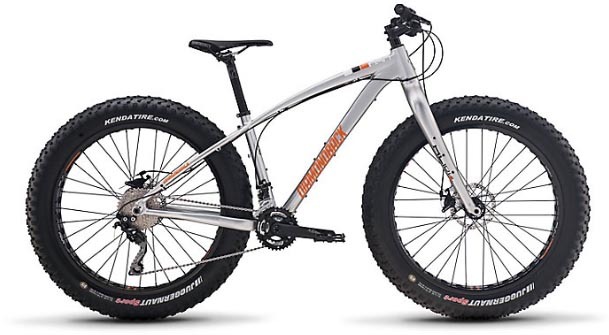 These tires are referred to as mid-fat or “plus,” and fall in between the standard 2 to 2.5-inch mountain bike tires and the true 5 inchers that you find on a fat bike. The benefits of a wider tire include increased stability, greater trail comfort, and traction. Obviously with more rubber comes more weight, and mid-range bikes that are already a little heavy can feel even more ponderous with plus tires. But done right, as is the case with the hardtail Cannondale Cujo 2 and Salsa Timberjack NX, the 2.8-inch wide tires do wonders for grip with few negatives. At first glance, it may appear that having more gears is a good thing—20 is better than 12, right? But that 20-gear (2x10 crankset) ride can actually be more cumbersome to use. On the trail, you need crisp changes to react to rapid ascents and descents, and swapping from the big to small chain ring in the front is a real time killer—not to mention it means excess weight and complexity. As manufacturers have found, a 1x11 drivetrain is the current sweet spot at this price with a wide enough but manageable range to handle the ups and downs of mountain biking. There are a few bikes around $2,000 still made with a front derailleur, including the Giant Stance, which is a good way for manufacturers to keep costs down. But as the industry continues to adopt larger rear cassettes (including the 1 x 12 on the Salsa Timberjack NX Eagle), look for the front derailleur to become completely extinct even for bikes under $2,000. Weight is an unfortunate area of sacrifice at the under $2,000 price point. All of the fancy technology and materials that drive mountain bike weights lower and lower have a significantly higher cost of entry. For most casual riders, it’s less of an issue, but if your trails involve extended climbs up fire roads or single track, the excess weight can be a factor. If shaving weight is one of your top priorities and you’re trying to stick to a budget, a hardtail is your best choice. In term of components, these bikes consistently do better at managing their heft, simply because there’s more leftover cash in the design budget when you don’t have to include a pricey rear shock and linkage. Another way to trim weight from your bike is transitioning to a tubeless set-up. Removing the tubes cuts away that all-important rotational weight, and can be done quite inexpensively. Further, you can run at a lower PSI, which increases traction and comfort without the fear of flatting. Many of the bikes on this list have tubeless-ready tires, but you’ll need to verify that the rims are compatible. It’s also possible to set up a standard rim tubeless, but the process can be a little arduous the first few times. Carbon fiber bikes are not new to the world of cycling, but they are certainly popular and often the center of attention on group rides. So what’s all the hoopla about? Carbon bikes are almost always lighter than their aluminum frame counterparts, sometimes shaving up to two pounds. While most beginner riders probably won’t notice much of a difference, those racing the clock will certainly enjoy the decrease in weight. And carbon fiber is actually known to be stiffer than aluminum, which is a boon for efficiently transferring power. Finally, their lack of welds and smooth shapes give these bikes a premium, sleek look. This boutique material is not without its downsides, however, and often costs hundreds, if not thousands, more than an equivalently spec’d aluminum counterpart. Prepare to get a lot less bike for your money should you go this route. Carbon frames are also said to be more susceptible to impending rock strikes and hits, something that aluminum can shrug off in most cases. And one of the biggest downsides of carbon fiber is that it is not easy to recycle, which is a positive upside for old aluminum bikes. Some brands, like Pole Bicycle Company, have actually decided to only produce aluminum bikes, stating that it is a more eco-friendly material (this argument is debatable, however). All in all, if you prioritize quality components over a light frame and want to keep your price point under $2000, then we think aluminum is the way to go. It’s no coincidence that ten of the eleven bikes to make our list have an alloy frame. There’s a good chance that you do a lot of your shopping online, so why not do the same when you’re ready to pull the trigger on a new bike? With more and more companies offering online checkout options, and the emergence of consumer-direct brands like YT and Canyon (more on this below), there’s never been a better time. But before you skip the in-store experience, there are a few questions you should ask yourself. Are you comfortable with minor bicycle assembly and adjustments? Do you know which size you need or geometry that feels most comfortable? Will someone be home to receive the delivery of your expensive new ride? A properly fitting bike is imperative for two-wheel enjoyment, and the thought of buying a rig without being able to throw a leg over it first may seem daunting for some. Luckily, almost all brands and online retailers provide an easy-to-follow size guide for their bikes. Simply locate your height on the chart and see which size it corresponds to. If you’d like to take it one step further, dive into the geometry chart, which shows frame dimensions for each size and can help you fine-tune your search. And if that isn’t enough for you, Competitive Cyclist has a comprehensive fit calculator which should more than satisfy the most discerning riders. While nothing beats seeing a bike in person, there are many sizing tools available online to meet most riders’ needs. The majority of shipped bikes require some sort of assembly, so it’s important to have a working knowledge of how they are put together. In the most basic situation, you’ll need to install the front wheel and pedals of a shipped bike. This sounds easy in theory—and it often is—but wheels can sometimes be tricky to line up correctly and pedals have reverse threads, which can be confusing for first-timers. At the other end of the spectrum, you may be required to cut the fork’s steerer tube, install the bottom bracket, and route cables through the frame—all of which require special tools and mechanical know-how. Online programs like Diamondback’s Ready Ride provide great bike-building tutorials, and if all else fails, your local bike shop will happily assemble your bike and fix any, or all, of your mistakes. This in-person service does not come cheap, ranging from $75-$150, but knowing your bike was properly and professionally assembled will ease your mind when bombing down sketchy singletrack. Consumer-direct brands like Canyon, YT, and Commencal have been operating in Europe for years, but the North American newcomers are mixing things up for U.S. consumers. These online-only brands offer a new way to purchase bikes at more affordable prices than what’s available in brick and mortar bike shops. 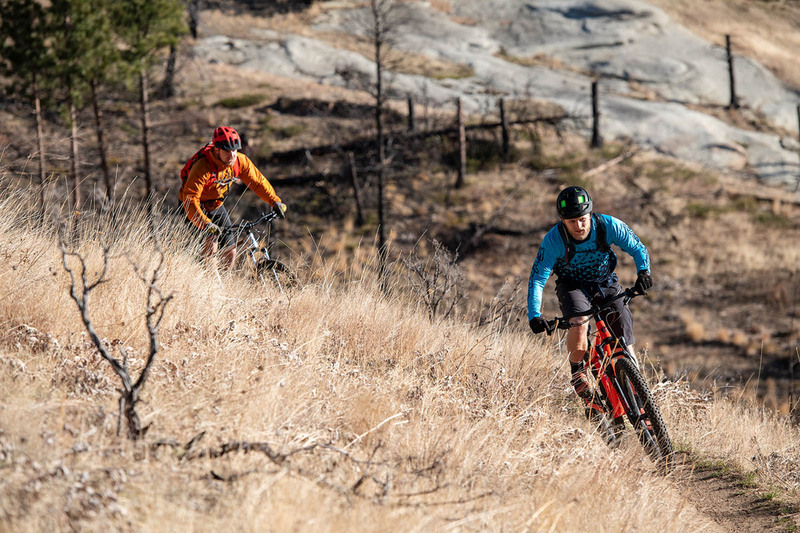 Consider this: with their carbon frames, 12-speed drivetrains, and mid-tier suspension components, Canyon’s Spectral CF 8.0 and Specialized’s Stumpjumper Comp Carbon easily go toe-to-toe. But at over $1,000 cheaper—and with a higher-quality drivetrain—the Canyon easily wins the battle. If you’re on the hunt for the best value, we recommend checking out consumer-direct brands before buying your next bike. There’s no denying the fact that consumer-direct companies sell their bikes at enticing prices, but is it too good to be true? We’ve heard plenty of horror stories: poor customer support, long wait times, and lack of inventory altogether. There’s also something to be said for supporting your local bike shop, although the trend seems to be towards these shops doing more repairs and fewer sales. However, if you’re simply looking for the best value bike on the market—and aren’t too risk averse to the potential downsides—it’s hard to ignore companies like Canyon, YT, and Commencal. Buying a used bike is a great way to cut down on waste and extend the life of a product, but there are a number of things you should consider before going down that path. The main appeal to buying used is saving money, but unmaintained bikes may end up costing you a lot in future repairs (and you won’t be able to utilize the manufacturer warranty in most cases). It’s important to check the drivetrain for wear: specifically, are the chainring teeth shaped like shark fins (as opposed to triangles), or missing altogether? If so, then those need to be replaced. How many miles does the chain have on it? Use a chain checker tool to see if it’s worn out. It’s also important to closely inspect the bike frame for cracks or major dents—if either are present, we recommend moving on. Similar to buying a pre-owned car, the best way to ensure you're purchasing a quality used bike is to have a shop check it out. We recommend calling ahead of time and asking if a bike technician can take a few minutes to go over the bike. When you’re spending hundreds (or thousands) of dollars, we think it’s worth the time and hassle for a professional opinion. All in all, buying used can be a great way to get a quality bike at half the original price, but just be aware of the possible risks that are involved.